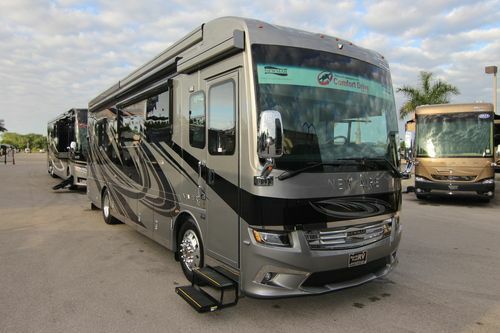 Newmar New Aire diesel motorhome for sale in Florida. The 2018 Newmar New Aire diesel pusher motorhome is a different kind of premium coach, built from the ground up to deliver you with big luxury in a smaller package. At just over 12 feet tall, New Aire provides automatic steps that sit a mere four inches from the ground with the air suspension lowered, and comes equipped with our renowned Comfort Drive™ steering system in addition to a 360-horsepower Cummins® diesel engine. The 2018 Newmar New Aire motorhome also features keyless ignition with push-button start and the RoadWatch™ safety package, which includes electronic stability control and available adaptive cruise control with collision mitigation technology. Underneath, a custom-engineered version of the Newmar STAR Foundation is seamlessly welded to a specially designed Freightliner® XCS chassis that produces an outstanding 60-degree wheel cut. The 2018 New Aire motor coach offers three distinct versions of our Masterpiece™ finish, a full-paint finish applied in house by Newmar artisans. New Aire also lets you select between three stylish interior design options and three (3) hardwood cabinetry finishes, all of which can be had in spectacular high-gloss form. Up front, you will find dual 9” monitors with Rand McNally® navigation and a side-view camera display. Each Newmar New Aire master bath comes fit with a roomy linen closet. In the bedroom, Cathedral Ceiling adds six inches of headspace. You can watch each sunrise without getting out of bed thanks to a sliding-window headboard. Available with a Whirlpool® stacked washer and dryer, New Aire grants you two solid-surface nightstands that double as charging stations for your mobile devices. 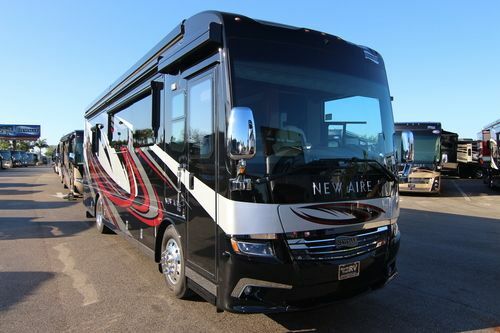 The 2018 Newmar New Aire comes in the following floor plans, 3341 and the 3343. 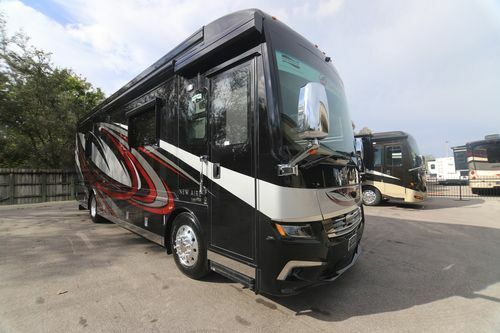 Please view our Newmar New Aire motorhome inventory below.